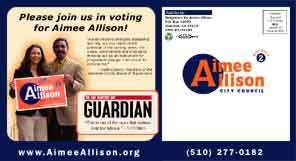 Although I have no training in graphics, I've been doing a lot of design work for campaigns. We often need literature very quickly, so I've been learning Adobe Illustrator, preparing data for offset presses, and dealing with the print shops. Each of these pieces was a collaboration. The real graphic artists create the key design elements, like logos and taglines. I do new layouts and formats with them. We all contribute to the message, and we're getting better at the art of communication. Click on the images below for more details. This card is an introduction to the candidate. 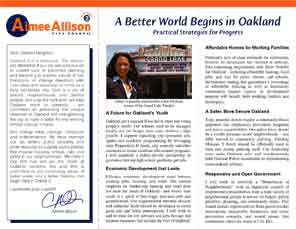 The front has a bullet point resume and the back tells part of the candidate's biography conveying her personality and moral character. It does not cover the election issues. This works well as a component in fundraising. At 4 x 8 inches, it is sized to go into a number 10 envelope, paired with a cover letter and a remit envelope. The cover letter is a more effective "ask" when background information is carried seperately. While mailing alone is not a very effective appeal, this package makes the follow up phone call much easier. This six inch envelope makes donating to the campaign quick and convenient. It fits into a regular envelope, and can be handed out at house parties or other events. Finance laws require that campaigns record and report information on donors such as address, occupation and employer. The inside of the envelope has a form for the donor to fill out, which includes endorsing, volunteering and credit card payment. A little more expensive than the introduction card, this brochures does the same thing. It introduces a voter, or a potential donor, to the candidate. We put them into fundraising envelopes and also kept a plastic dispenser outside the office. We left them in shops, and handed them out in crowds. You can also make them into self-mailers by sacrificing one panel. 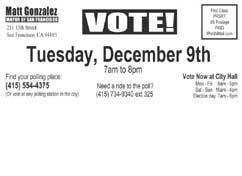 While the pieces above are geared towards supporters and donors, we hope to persuade voters with the tabloid. With many large pages, it has room for articles on the issues, an endorsement list, and the candidate's platform, but the most important part may be the center spread of photographs. Of course, many voters will not read all this. However, without reading a single word, I believe it conveys the message that the candidate has substantive ideas and plans. I think the newspaper style format makes it a little more authoritative. 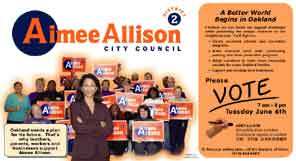 Our volunteers hand carried 22,000 of Aimee's tabloid to the voters over a month. At about 13 cents each, they are inexpensive and I believe they're very effective. 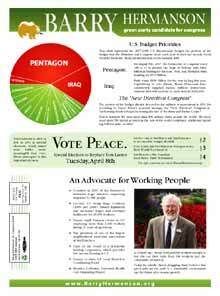 The second time I designed a tabloid, the process was much faster - about two weeks. The slowest part is collecting the photographs and permission to use them. Barry and I mailed about 20,000 to absentee voters, and another 20,000 to poll voters a few weeks later. I do NOT recommend this. 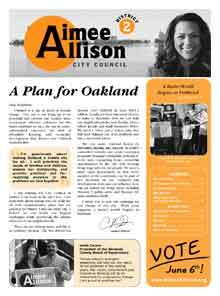 Newsprint is too much like the supermarket flyers, so many voters don't even notice them in the mailbox. Complete images and other details for both tabloids are here. Unlike walking, mailing allows you to send messages tuned to each constituent group, and absentee voters may be the most important such group. 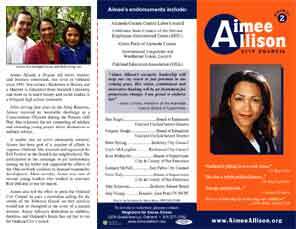 The absentee chaser should be timed so that it lands in the voter's mailbox on the same day that their ballot arrives. I believe that you only get the voter's attention between the mailbox and the trashcan. Therefore, you must convey a clear, simple message in graphics. Images are our vocabulary; if we don't have a picture, we can't talk about the subject. Keep a camera handy! Details on our absentee chaser are here. Multiple language mailers, and saving money with gang run printing here. These door hangers are designed to double as window signs for a home, business or car. They are 20 inches long and 4¼ wide, a size optimized for our shop's printing press. We paid 12.5 cents for each, and distributed 40,000 of them. I worked with Melissa Watson on this. She did the front, while I did the back. Pat was very pleased. These 3 x 4 inch cards are over sized business cards. They're great for passing out in a crowd. Full color both sides, they cost less than 2 cents each. 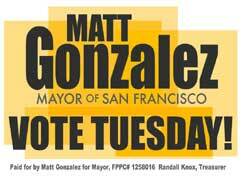 During the Matt Gonzalez' campaign for Mayor of San Francisco, I mailed 18,000 postcards reminding people to vote. I modified Rob Arnow's window sign for the front. The dimensions were 5.5 x 4 inches, which qualifies for the cheapest first class postage rates. That size also fits 8 up on an 11 x 17 tabloid sheet. When I had them printed, I also got 2500 sheets with the back side blank. We used these to make instant handbills with my laser printer. By printing an invitation to an event on the back, we got professional color results in minutes. We printed this image at 60 x 28 inches (5 ft). The photo was taken on 35mm print film, speed unknown. Large format printers are capable of 600 dpi and higher, but our image was only 75 dpi. It looked great from a distance but a bit blurry close up. Next time I'll hire a photographer with a Hasselblad or similar medium format camera. With the exception of some very expensive pro models, digital cameras are not yet ready for large scale photography.